Authentic, micro-brewed iced tea is both our passion and avenue to delight, educate and support cause-based initiatives at home and abroad. We source our ingredients from locally run businesses and brew our teas in small batches to ensure the best quality and flavour. Our hope is that you'll love them as much as we do. Famous for its striking orange colour, our Traditional Thai is a creamy dessert tea with notes of star anise and orange blossom sweetened with Organic Cane Sugar. 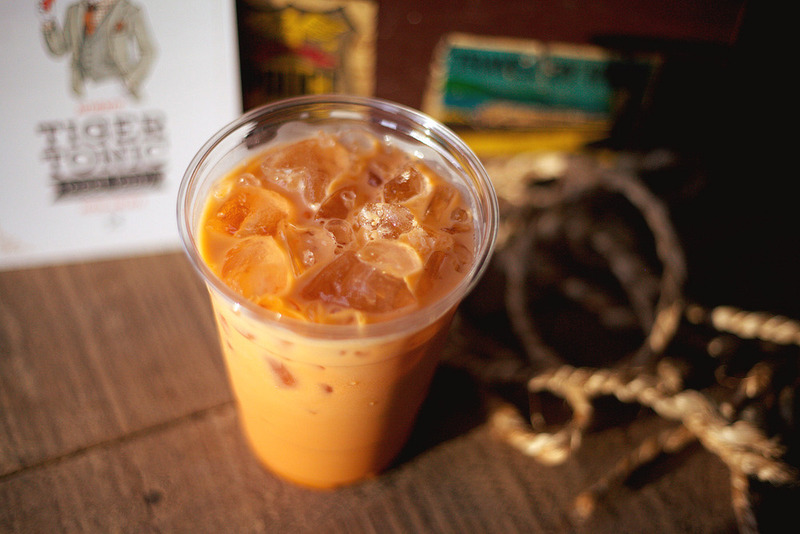 Served with your choice of milk (Full Cream, Skim or Soy) over ice, it is a delightful experience. 10% of drink sales provide ongoing support to The A21 Campaign in Thailand to prevent modern day slavery through awareness and education. Our Creamsicle Oolong is a refreshing Taiwanese tea, lightly sweetened with Organic Cane Sugar and served over ice with a splash of freshly squeezed orange juice. *Please Note: May contain traces of milk from the loose leaf tea preparation process. ©2016 Tiger Tonic. All rights reserved.